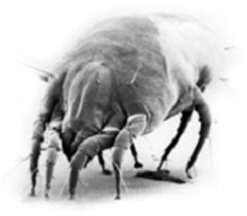 Dust mites can be a big problem for Asthma and allergy sufferers. In fact, they have been cited as one of the major triggers of asthmatic and allergic reactions – another reason why so many clients are still replacing their carpets with laminate flooring. ProMite™ is proven to safely remove and repel dust mites from carpets and fabrics for up to 14 months. It doesn’t just inhibit mite excrement, Promite™ gets to the source of the problem by removing the mites. ProMite™ is totally non-toxic and safe for children and pets – even if it were accidentally picked up off the carpets and ingested. Independent testing shows a dramatic reduction of asthma and other allergyies when used as an allergy control programme. This is great news for asthma and allergy sufferers, or in fact anyone who’s worried about the possible medical effects of the common house dust mite. No dust mites for up to 14 Months! ProMite™ is also an effective stain protectant. You get all the benefits of a fluorochemical-based protector, with the added allergy control benefits only ProMite™ can offer. A great add-on service to any carpet cleaning job.